Over the last few years my Threat-Centered Revolver course has become the most popular class I teach. When I put this course together I thought there couldn’t be enough demand to teach it more than once every couple of years. Boy, was I wrong! This course is consistently well-attended, with many people flying across the country just to take part. I also have a higher number of repeat students than any other course I teach. 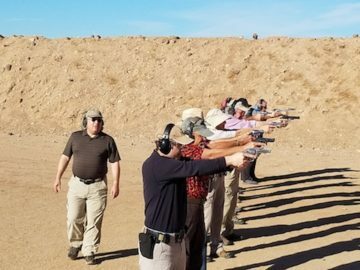 They all tell me it’s hard to find good, solid revolver training and that they jumped at the chance to finally take a class that addressed the unique demands of mastering the revolver. The second most popular is my Perimeter Defense rifle course. This is a rather unusual class, as it focuses on the defensive use of the rifle beyond the ‘CQB’ distances and circumstances covered by most carbine classes. It’s aimed (if you’ll pardon the pun) at the person or family who lives on something other than a typical suburban lot and can make use of the precision and power the rifle is capable of delivering. It’s also based on realistic use of the rifle as a defensive tool, which means it’s relatively capacity-agnostic and isn’t predicated on the notion that you’ll be out patrolling with your rifle when something bad happens. I’ve attended a lot of rifle classes over the years and I’m always amazed at how even those claiming to be “reality based” are really little more than fantasy enter-train-ment. All of my own defensive gun uses have been with a rifle, and none of them resembled what I experienced in any of those classes. Those experiences led me to develop Perimeter Defense as a functional blend of both old and new. It is, I believe, the most practical defensive rifle course available. An interesting development has been the increase in the number of private (closed enrollment) classes I’ve taught. A private class is one in which an organization — such as a gun club or affinity group, formal or informal — brings me in to teach a class for the exclusive benefit of its members. In 2017 well over half of my students came from these private classes, which is a sharp increase from previous years. I rather enjoy those opportunities, as they allow me to go to places and meet people I might not otherwise connect with. Many of the students in these private classes are people who would be considered non-traditional gun owners, people who don’t feel comfortable in the politically- or testosterone-charged atmospheres they’ve encountered in other classes. I’ve met some gracious (and very interesting) people as a result. It looks like 2018 is going to be busy! In addition to the normal compliment of classes and some new books in the works, I’m also hoping to hold my first Colt Revolversmithing class. This is something I’ve both wanted and been asked to do for many years; it will give me a chance to pass on many of the specialized gunsmithing techniques for the notoriously complicated Colt V-spring actions, as found in the Python and Detective Special. I’ve located two possible venues and, with any luck, hope to be able to debut the class sometime in the fall. There are some other courses in the works as well. I’ve been asked to participate in a major conference to teach comprehensive security for houses of worship, and I’ve had many requests from readers of Prepping For Life to hold a workshop based on that book. Both are still in the planning stages, so stay tuned to the blog for announcements. In 2018 I’d also like to get to more areas of the country to teach Threat-Centered Revolver and Perimeter Defense. I’ve had many inquiries from Texas, for instance, but have never been able to put anything together down there. If you’re in Texas and would be interested in hosting either of these courses, please drop me an email! The same is true for other areas of the U.S. I generally get to the San Francisco area every year, but haven’t yet taught in southern California — and would love to. I’d also like to visit the northeastern part of the country; despite the often draconian gun laws in those states, I know there are people living there who want and need good training. No matter where you are, if you think there are enough students to make a class viable, send me an email. We’ll discuss the options and possibilities for holding a class in your area in 2018. P.S. : Did I mention that the host for any of my classes gets to attend free? What are you waiting for? Hey Buddy!, I found this information for you: "As 2017 comes to a close, I’m looking forward to 2018!". Here is the website link: http://www.grantcunningham.com/2017/11/2017-comes-close-im-looking-forward-2018/. Thank you.